From left: Kevin Remington (Fred), Joanna Daniels (Ethel), Sirena Irwin (Lucy), and Bill Mendieta (Ricky). But praise it I must, even with qualifications, and even though I fear that favorable reviews of this improbably charming show might encourage future producers to turn the theater into a blasted hellscape littered with “Two and a Half Men Live on Stage’’ and other sitcom-to-stage atrocities. OK, perhaps I’m overthinking this. That’s certainly not a mistake made by adapters Kim Flagg and Rick Sparks. Their approach to the cumbersomely titled “I Love Lucy Live on Stage’’ (at the Colonial Theatre through Dec. 22) relies primarily on a straightforward reproduction of the original, albeit delivered with an affectionate wink and flavored with elements of a variety show. Flagg and Sparks (who also directs) tap into the still-deep reservoir of affection for Lucille Ball, who remains the greatest comedienne in TV history, with apologies to Carol Burnett, Mary Tyler Moore, and Julia Louis-Dreyfus. Even though such icons of 1950s television as Sid Caesar and Milton Berle are scarcely remembered by the general public, we do indeed still love Lucy. 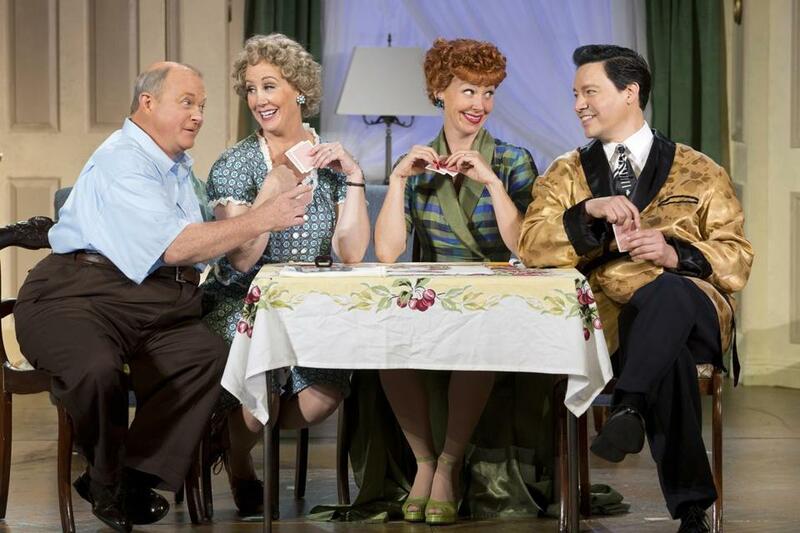 That carries obvious peril for the performer who has to play her, but Sirena Irwin pulls it off in “I Love Lucy Live on Stage,’’ and quite winningly too. Though Ball’s portrayal of Lucy Ricardo was of course sui generis, Irwin comes creditably close to capturing Lucy’s plaintive tone of voice, her wide-eyed “Who, me?’’ posture of aggrieved innocence, her canyon-sized mouth when she bawled at some setback, and her slapstick gyrations. Sirena Irwin and Bill Mendieta approach the roles of Lucy and Ricky Ricardo with a shared joy and sense of duty. The stage show is built upon performances of teleplays from actual episodes of “I Love Lucy’’ that focus on Lucy’s avid showbiz aspirations, which was a prominent theme during the show’s run from 1951 to 1957. The conceit is that it is 1952 and we in the audience are present for the taping of two episodes in the “Desilu Playhouse,’’ guided through the evening by a host played by Mark Christopher Tracy, who hits just the right note of hearty bonhomie as he delivers a line of corny patter. Old-fashioned, tripod-mounted TV cameras stand on the stage, which is surrounded by red curtains. A couple of sequences with audience plants fall flat and slow the show down to a crawl. Much more enjoyable are the song-and-dance performances by a crackerjack ensemble. Dubbed the Crystaltone Singers, they deliver throwback fun, punctuating the action with numbers that double as commercial endorsements for products like Brylcreem, Palmolive, and Halo shampoo. In one episode, Lucy is intent on scheming her way into a duet at a benefit with her husband, bandleader and singer Ricky Ricardo (Bill Mendieta, quite good in a difficult role). In the other, Lucy’s attempt to perform is complicated by the eyedrops she received. Still, this kind of reenactment may strike you as a ripoff. Why pay steep theater prices to see a live reproduction when the original still lives on in the eternity of TV reruns? It’s true there is no pressing need to see this stage version. This is not must-see theater by any means. This is theater as comfort food. But on that level, it’s pretty tasty. On a couple of other levels too. Take the relationship between Lucy and Ethel. As you watch their playful camaraderie, you can’t help thinking about how very, very seldom television has depicted female friendship with the concentration and depth seen in “I Love Lucy’’ more than half a century ago. I’ll take these two women over “Two and a Half Men’’ any day.